Description: This monograph provides a fresh perspective on judgment according to works by challenging both the majority scholarly view and the new perspective advocated by E. P. Sanders, James D. G. Dunn and N. T. Wright. Employing intertextuality and early Jewish mediation of scripture, this study examines the idea of judgment according to works with reference to Psalm 62:13 in early Jewish literature and the New Testament. The originality of this study is to highlight the significance of Psalm 62:13 in the context of judgment according to works and to argue that the texts dealing with judgment according to works in the New Testament are to be understood as interpretations of Psalm 62:13 and its broad context. 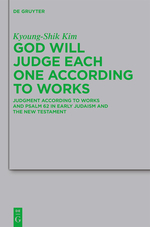 Citation: Travis B. Williams, review of Kyoung-Shik Kim, God Will Judge Each One according to Works: Judgment according to Works and Psalm 62 in Early Judaism and the New Testament, Review of Biblical Literature [http://www.bookreviews.org] (2014).